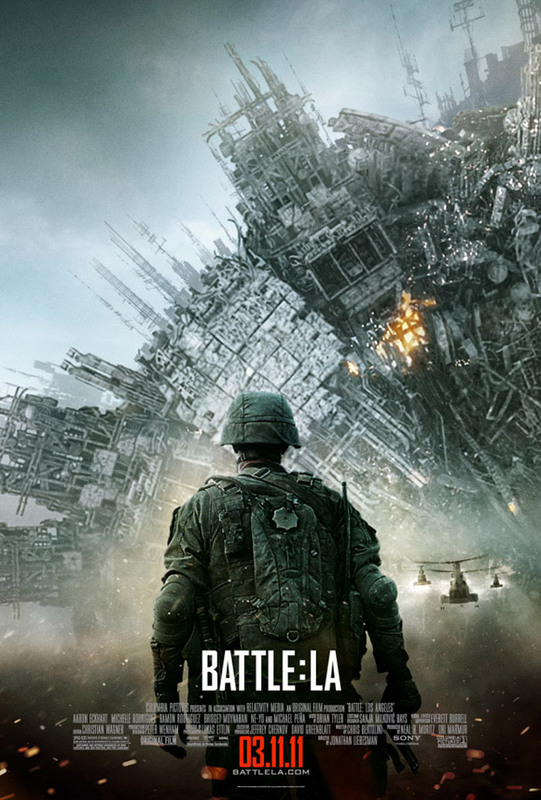 Columbia just released the slightly disorienting new poster for Battle: Los Angeles. The film is directed by Jonathan Liebesman and stars Aaron Eckhart, Michelle Rodriguez, Bridget Moynahan and Michael Pena. Synopsis: For years, there have been documented cases of UFO sightings around the world -- Buenos Aires, Seoul, France, Germany, China. But in 2011, what were once just sightings will become a terrifying reality when Earth is attacked by unknown forces. As people everywhere watch the world's great cities fall, Los Angeles becomes the last stand for mankind in a battle no one expected. It's up to a Marine staff sergeant (Aaron Eckhart) and his new platoon to draw a line in the sand as they take on an enemy unlike any they've ever encountered before.